If there’s one thing we love it’s follow ons and Playtech have played right into the hearts of Boku Slots with this instalment of the Age of Gods series. Age of Gods: Fate Sisters follows on from games such as Kings of Olympus and God of Storms, and is now bringing into the limelight the three fates from mythological tales. 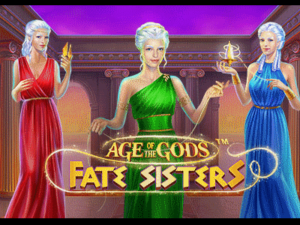 Age of Gods: Fate Sisters is a 5-reel, 25 pay line slot that has an RTP of 92.95% to 93.02%. What it loses in RTP it gains in features which include two bonus games. Set against a backdrop of purple pillars, it gives off an air of opulence befitting the three sisters. Bet Amounts – Betting begins at 1p per pay line up to £1 per pay line. There are no other adjustable variables on this game, aside from the amount of pay lines and the bet amount. As a result, it makes this one of the more affordable of the Age of Gods series, as spins start from 1p for 1 pay line upto £25 if playing at the full bet amount and full pay line capability. Wild Symbol – The wild is a golden coin depicting an image of the three fates themselves. The wild substitutes for all symbols except the scatter and is the highest paying symbol on the game. Land five of the wilds on an active pay line and you will win 10,000 coins. Scatter Symbol – Your scatter symbol is an open portal and it will transport you to the bonus games, so all you need to do is land 3 or more anywhere on the reels. Other Symbols – Whilst game is in play you will notice the other symbols which include the three sisters, Lachesis, Clotho and Atropos, who only pay out during the Sisters Gift Feature game. But you will also see symbols such as the golden shears, the spindle and the letters A, K, Q, J, 10 and 9, with the last two-digit symbols being the lowest paying of all. Sisters Gift Feature – To trigger this bonus game you need to land Lachesis anywhere on reel 1, Clotho anywhere on reel 3 and Atropos anywhere on reel 5. 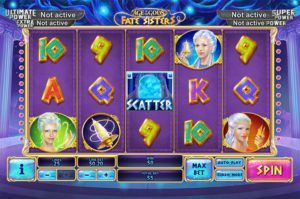 You will then be awarded one re-spin of the reels, with the sisters frozen into place and hopefully contributing to bigger win combinations for you. Atropos’s Temple – awards 15 spins, Atropos landing on reel 3 awards 3 extra spins and there are dynamic wilds offering multipliers between x2 and x5 the win. Lachesis’s Temple – awards 10 spins, locked wilds which remain in place for 3 spins, Land Lachesis on reel 3 and receive 3 more spins. Clotho’s Temple – awards 8 spins, 3 wilds appearing randomly on every spin and land Clotho on reel 3 to receive 3 more spins. Progressive Jackpot – As with every Age of Gods game, there is also the progressive jackpot that can be randomly activated at any time. The higher your stake amount the more chance there is of this happening. You will be given a screen full of coins to choose from. Simply pick coins to reveal symbols that relate to one of the jackpots or powers available. The four powers are Ultimate power, Super power, Extra power and Power, once you collect three symbols you win that jackpot. This means when you trigger this feature you are guaranteed a win. Yes, the RTP is low on Age of Gods: Fate Sisters, we know. But just look at what you are gaining instead, a progressive jackpot, a re-spin feature and a bonus game choice feature, which can all be very lucrative. On top of that we are introduced to yet more characters in this interesting saga and for that alone we are jumping for joy. The graphics aren’t as great as some of the other games, but overall the game play is aesthetically pleasing and the extras features are very exciting.